Put down your turkey leftovers and the rum-infused eggnog – it’s time to recap our favorite posts on Visual Capitalist from 2015. The following list includes a mix of infographics, data visualizations, and charts. Some of the posts listed here were among the most popular graphics on the entire site. Others that made the list are graphics that are diamonds in the rough. If you are new to the site, it also may be worth checking out last year’s edition of this post that covered the best content from 2014. The standard measure for national debt compares a country’s debt with its economic output as measured by GDP. In this data visualization, however, we showed that the world looks very different using a debt-to-revenue ratio instead. We visualize the national debt as compared to the amount of tax revenue coming into the central government’s coffers, which is arguably a better way to look at a country’s capacity to pay. Over recent years, the world has been under siege from cyberattacks. Blue chip companies like J.P. Morgan Chase, Target, and Sony were hacked, and even the U.S. government was compromised with over 20 million records stolen. Cybersecurity companies are here to help us fight back, and that’s what makes the industry interesting for investors. The market in cybersecurity is expected to be worth more than $170 billion by 2020. Every wonder how much power in the United States is generated by solar in comparison to nuclear plants? This post is for you. In this data visualization, every power plant in the country is mapped and quantified. The end result is a crystal clear picture of how electricity is really generated. Did you know that China’s cultural affinity for jade has existed for longer than Western civilization? This highly illustrative three-part series examines this as well as the emerging nephrite jade market in British Columbia. Around October, U.S. lawmakers reached an impasse on raising the debt ceiling. Republicans wanted to play hardball by linking a ceiling increase to conservative issues, but our chart shows that this kind of brinkmanship may have been inauthentic to start with. The reality is clear: the debt ceiling has risen no matter who is in office. There’s a new “cold war”, but this time it is in the freezing Arctic. Over recent decades, ice has thawed in the Arctic and 2008 became the first year that both the Northeast Passage (North of Russia) and the Northwest Passage (North of Canada) were open to ships simultaneously. This means it may be the first time that a vessel could theoretically circumnavigate the North Pole in 125,000 years. Not surprisingly, countries such as Russia, Canada, Norway, Denmark, and the United States have taken notice and are posturing accordingly. Polls show that 65% of millennials feel confident about their finances. This is higher than all other generations. The problem? Their actual knowledge about investing, debt, and banking is questionable at best. The majority of Americans are worse off than they were 15 years ago. That’s because Census data shows that 1,623 counties reached their highest income in 1999. Even further, there are 782 counties that have their best days way behind them. Their incomes peaked 35 or more years ago. We’ve all heard about “Big Data”, but what is it really? This infographic explains everything you need to know behind this new reality for business, and its implications for companies and investors. The Economist has determined that Canada’s property market is the most overvalued in the world in terms of rent prices (+89%), and the third most overvalued in terms of incomes (+35%). In the post, we go over some of the arguments for and against Canada’s frothy market. The 1.4 billion people living in China account for 13% of global GDP, but this chart shows that for commodity producers, the country means so much more. China consumes upwards of half of the world’s cement, aluminum, and nickel, along with huge amounts of other base metals, energy commodities, precious metals, and food. Two weeks before this post, we had published a chart showing the world economy in one visualization. In the corresponding comments section, a user asked us if we could put together a similar visualization but instead looking at world debt. The industrial internet is the convergence of the global industrial sector with the internet of things. In this infographic we show how this new technology will change how the mining sector works. This was one of our favorite posts of the year. In this slideshow, we visualize what it takes to power NYC with every type of energy including gas, wind, solar, nuclear, and more. We created this year’s top post for The Money Project which we are doing in conjunction with Texas Precious Metals. In the data visualization, we compare the world’s money and markets to help give perspective to global money supply. The final result was one of our most viewed infographics of all time, receiving over 1,000,000 views in just a matter of weeks. It was featured on Marketwatch, Business Insider, Zero Hedge, Morningstar, as well as making the front page of Reddit. What was your favorite post of the year? What would you like to see more of? Feel free to sound off in the comments section. We count down our favorite infographics and charts from the year, including many you may not have seen before. Catch some of our best work in this Top 17 list. It’s that time of year again, and 2017 is almost in the rearview mirror. With another year biting the dust, we are excited to present a curated list of our favorite infographics, charts, and data visualizations that we posted over the course of 2017. If you’re new to Visual Capitalist, this annual countdown is one of the best ways to get acquainted with what we do. It tallies the year’s most powerful visuals that explain the world of business and investing. If you like what you see below, don’t forget to subscribe to our mailing list or connect via Facebook, Twitter, or LinkedIn to get our free content daily. It’s also worth mentioning that many of these below graphics will be included in our upcoming book, which you can still pre-order today. At the end, we’ll link to some honorable mentions, as well as the year-end lists for 2014, 2015, and 2016. Enjoy the countdown, and we wish you the best in the new year! The final installment in our five-part Battery Series, this infographic covers what is coming down the battery technology pipeline in the future. It looks at the near-term advancements that will be made with lithium-ion batteries, as well as more unproven, distant technologies like Li-S, Li-air, and Na-ion batteries. Ever wonder who owns the 100 most popular websites in the world? This massive infographic links it all together, and allows you to see the powerhouses that rule the internet. This infographic shows the world’s richest people, with a focus on the pre-modern era that occurred before the Industrial Revolution. In it, you’ll find details on the fortunes of famous names like Augustus Caesar, Mansa Musa, King Solomon, Genghis Khan, and the Medici family. Do you know how tech giants like Facebook, Alphabet, Microsoft, Apple, and Amazon make their money? This chart breaks down the revenue streams for each company in an intuitive and simple manner. It’s often difficult to comprehend the size and scale of the economic boom in China. That’s why it’s a topic we approach quite often with our visualizations – and we felt this one really hit the mark. Using a mind-boggling map, we compare each of China’s 35 biggest cities with the economies of entire countries. How many of these massive Chinese cities do you think you can name? It was a landmark year for cryptocurrency, and Bitcoin’s ultra-quick journey from under $1,000 to $10,000 in just 11 months was the centerpiece of the excitement. This nifty infographic documents the ascent, as well as the major events that happened over the course of the year in the space. Artificial intelligence is going to impact every facet of our lives, and this infographic summarizes the impact and potential breadth of possibilities that AI will bring once it is ubiquitous. The year started with the controversial inauguration of Donald Trump – and this video, which was released around that time, sums up a major issue he faces during his presidency. How he approaches the country’s record-high $20 trillion national debt will be an important factor in whether he is able to make America “great again”. Has it been your lifelong dream to see every one of the existing 188 cognitive biases mapped out and organized in a useful codex? If so, then today is your lucky day. What makes an economy competitive at the global level, and why? This useful animation shows how countries compare using the Global Competitiveness Index – and then later in the post, the factors influencing competitiveness are explained and compared. Back in September 2017, when a bitcoin was only worth $4,000, we made this chart to make sense of the cryptocurrency universe. It compares the differences between Bitcoin, Litecoin, Ethereum, Ripple, Dash, and Ethereum Classic – and it shows key metrics around volume, market capitalization, and transactions. It’s all fairly out of date now, but that’s how the crypto space rolls. There is now a total of $63 trillion in global sovereign debt, and this colorful chart breaks it down by country and debt-to-GDP ratio. See the large version in all its glory here. This marvelous infographic tells the story of Warren Buffet’s early years, including his various childhood business pursuits, his first stock purchase, and other events that have helped shape the Oracle of Omaha’s career. This is the start of our five-part Warren Buffett series, which will continue through 2018. What are the world’s most valuable brands? This big chart counts down the companies with the most brand value in 2017, and also gives historical perspective (shown above) on the most valuable brands over time. Today, we know Tesla as an important leader in the green revolution, developing everything from electric semi-trucks to Powerwalls. 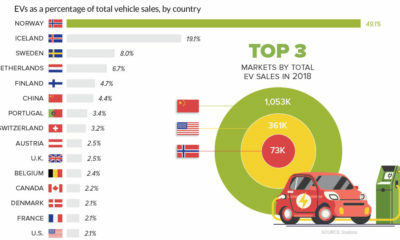 However, Tesla’s success wasn’t always a given – and this beautiful infographic tells the story of Tesla’s early vision, the company’s strategy to shed the stigma around EVs, the cost overruns in developing the Roadster, and the company’s narrow escape from the brink of bankruptcy. It was the first piece of our three-part Rise of Tesla Series – the rest will be released in early 2018. This memorable chart shows that Walmart has the most employees in a whopping 22 states. With nearly one million views and 75,000 social media shares, this was our most-shared post of the year. A remake of our 2015 graphic that “put us on the map”, this is the latest update to All of the World’s Money and Markets in One Visualization. Including stats from both versions of the graphic, this visualization has now been seen by more than 1.5 million people on our site alone. 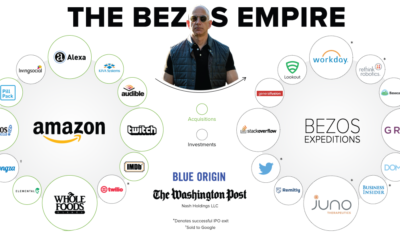 Made after Amazon’s acquisition of Whole Foods, showing all the companies that Bezos has invested in or bought. This crazy chart made in 1931 isn’t ours, but it’s super interesting.